Moses Ogbu continued his remarkable start to the season after bagging a brace and an assist in IK Sirius's 4-1 rout of Elfsborg in the Swedish Allsvenskan on Sunday. The visitors had taken the lead in the fourth minute before Ogbu set up Gustafsson for the equalizer in the 12 minute. The Nigerian striker made it 3-1 in the 75th minute and added more gloss to the scoreline with nine minutes left on the clock. 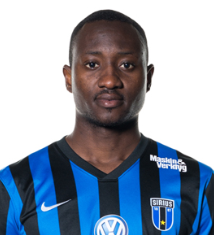 The 26-year-old Ogbu has impressed in the last one month, netting against Norrköping and BK Hacken before yesterday's game at Studenternas IP. Only Djurgården pair Engvall and Eriksson, with five goals to their names, have scored more goals than Ogbu in the current season.